KING OF PRUSSIA, PA--(Marketwire - November 25, 2008) - Select-A-Branch ATM Network, LLC, ("SAB") and Access to Money, a wholly owned subsidiary of TRM Corporation (PINKSHEETS: TRMM), today announce that the companies have reached an agreement in principle, which, pending final approval, enters the companies into an exclusive distribution alliance. The alliance grants Access to Money the exclusive right to deploy SAB-enabled ATMs both in their existing Access to Money footprint or seek new locations and merchant relationships in the United States interested in the benefits of the growing SAB network. SAB provides patent-pending software and services model that allows SAB-enabled ATMs to recognize the card issuer and automatically deliver a branded surcharge-free transaction to the cardholder. The resulting customer experience conveys the same look-and-feel, logo and advertisements as the issuing bank or credit union displays on their own ATMs. Financial institution participation requires a simple pay-per-use reimbursement model, avoiding the set-up and bulk buying typically associated with branded and surcharge free ATM programs. "This alliance represents a major step forward for SAB," commented Dan Gardner, SAB Chief Executive Officer, "and one that we believe will dramatically increase the growth rate and acceptance of our network. We are working hard to open up multiple new markets and bring this valuable new customer retention and acquisition tool to dozens of new financial institutions." Access to Money agrees. "The SAB alliance allows us to offer our customers the benefits of this innovative and cutting edge technology. Through this relationship, we can allow retailers the opportunity to deliver branded surcharge free transactions to their patrons, resulting in increased foot traffic and additional sales at the register," commented Richard Stern, Access to Money's President and CEO. "From our first introduction it was apparent that SAB's revolutionary capability was a perfect fit with Access to Money's operational excellence," said Doug Falcone, Access to Money's Chief Operating Officer, "and one that we are quite confident will draw the attention of premiere merchant brands interested in maximizing the benefits of their ATM channels." Mr. Falcone is referring to a recent SAB case study in which 59 New York City McDonald's franchise restaurants were integrated into the SAB network, producing remarkable results over a 6-month period in early 2008. "The numbers speak for themselves," commented Dan Stechow, SAB Chief Operating Officer. "Between March and August of this year we measured a 35% growth in transaction volume across these locations. The McDonald's franchisees are linking this to a 1% increase in same-store sales, which is all the more remarkable given the overall decline in national ATM transaction volumes. SAB produces credible results." The deal will allow each company to focus on its core strengths. Access to Money will leverage its national sales force and service and support teams to secure high-traffic locations; SAB will continue to leverage its branded customer experience capabilities in order to grow network participation. Access to Money, a wholly owned subsidiary of TRM Corporation, is a consumer services company that provides convenience ATM services in high-traffic retail and entertainment environments. In addition, the company offers ATM and security products and services to financial institutions. The company's customer base is widespread, with retailers, entertainment companies and financial institutions throughout the United States. Access to Money operates one of the largest non-bank ATM networks in the United States with over 10,000 locations. 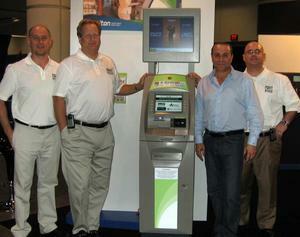 Executives Dan Stechow (Select-A-Branch COO), Dan Gardner (Select-A-Branch CEO), Douglas Falcone (Access to Money COO) and Michael Tedesco (Select-A-Branch VP Financial Services) stand in front of a Select-A-Branch wireless, digital-enabled ATM.